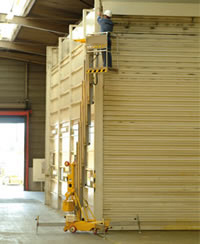 Light, compact and designed for fragile floor-surfaces, this type of electric platform is for indoor use. They rise to between 15ft and 40ft in height. They are ultra-light and easily transportable, even in a van. Easy �stand up� access through flip up top rail"to basket. Only one man for loading and unloading. 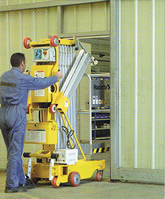 The Quick Up compact dimensions allows access through standard doorways. 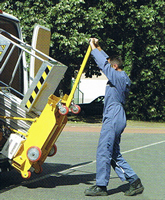 The Quick Up low weight allows works on fragile grounds. Cage and mast in aluminium. Working Height 20' 9" 25' 4" 29' 11" 34' 7" 38' 10" 41' 5" 45' 1"
Platform height 14' 9" 19' 4" 23' 11" 28' 7" 32' 10" 35' 5" 39' 1"
Max Platform size 2' 2" x 2' 3"
Stowed height 6' 6" 9' 1"
Stowed length 4' 0" 4' 2" 4' 5" 4' 7" 4' 9" 4' 5" 4' 7"
Stowed width 2' 5" 2' 7"
Outriggers footprint 4' 7" x 5' 7" 5' 3" x 6' 3" 5' 11" x 6' 11" 6' 8" x 7' 7"
Tilt bar 6' 11" x 5' 9" 9' 3" x 6' 6"